One important fact came to light during the latest FCA’s quarter presentation held by Sergio Marchionne. It’s nothing new but the confirmation of a trend observed since late 2014 that is the base for the immediate future of the group. The scenario in which Fiat Europe burnt money while Fiat Brazil generated cash is now part of the past and based on the latest figures, the situation has turned around so the new big problem of the group isn’t only Asia but Brazil and Argentina too. The European division of the group heads to the break-even point after years generating losses as a consequence of the deteriorating economic conditions in the continent that seem to come to an end thanks to good macroeconomic indicators. Meanwhile in Brazil, Fiat brand’s largest market, things are getting worse. The leftist government of Dilma Roussef hasn’t had a good effect on its economy: domestic demand drops, unemployment rate grows and the industry is under pressure due to increasing taxes and lower exports. Total revenue and profits keep growing but the composition has been changing since 2012. Brazil and Argentina are not profitable as in the past while Europe burns less money. 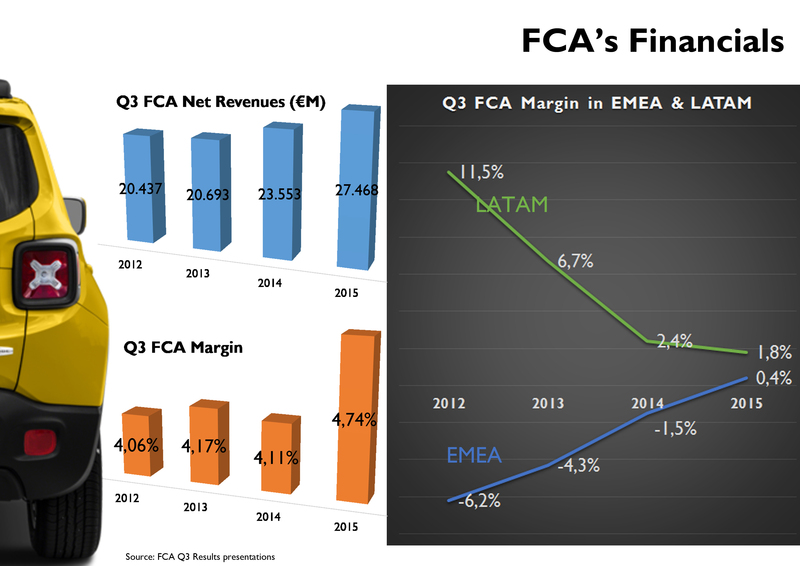 Source: FCA’s Q3 Results presentations. During the third quarter of this year FCA sold 1.114.000 cars worldwide, with NAFTA region counting for 61% of them. Total shipments increased 1,4% but the group became more dependent on North American operations as this division counted for 56% of total deliveries during 2014-Q3. Jeep and Ram good results in USA, Canada and Mexico allowed FCA to keep posting positive growth during July, August and September 2015, but again, the bad performance seen in Latin America (LATAM) and Asia (APAC), with the slowly recovery in Europe (EMEA) make of NAFTA the core region. In terms of revenue the dependence on NAFTA is even higher (63% of total) but a big change is taking place: EMEA registered a 13% increase after the timid +6% seen in 2014-Q3, while LATAM keeps falling with revenue down by 30% in 2015-Q3 and -12% one year before. In other words the figures keep improving in Europe and getting worse in Latin America. While total industry is back to growth but still far from pre-crisis numbers, FCA is one of the big players to post the highest sales increase in Year-to-date results. According to ACEA figures Fiat Chrysler still occupies the 7th position with registrations up 13,4% to 664.000 units between January and September 2015. It’s the third best volume growth in the top 10 right after Nissan and Daimler and is mostly explained by the positive change coming from Fiat and Jeep brands. Italy accounted 51% of the total with sales up 17,5% in a market that stopped dropping and is back to positive growth (+15,3%). One year before FCA was less dependent on its European home market: 49%. Thanks to the success of the Fiat 500 and the introduction of the Jeep Renegade and Fiat 500X, the group has been able to offset the Alfa Romeo and Lancia’s sales drop, and the poor results of Fiat brand in B and C segments. 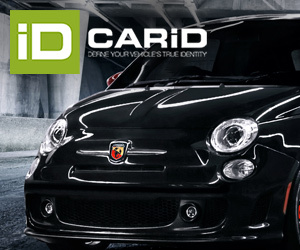 In terms of volume the Fiat 500 is the real popular model. It’s still the only car of the group that is highly appreciated outside Italy with important performance in the UK (at 11th position) and France (21st best-selling car). Contrary to the majority of the FCA products, Italian demand represented only a quarter of the Fiat 500 total sales in Europe (till September 2015). Therefore it can be easily considered a real success, but the only one, as the Jeep Renegade and Fiat 500X are still far from the volume registered by their competitors. 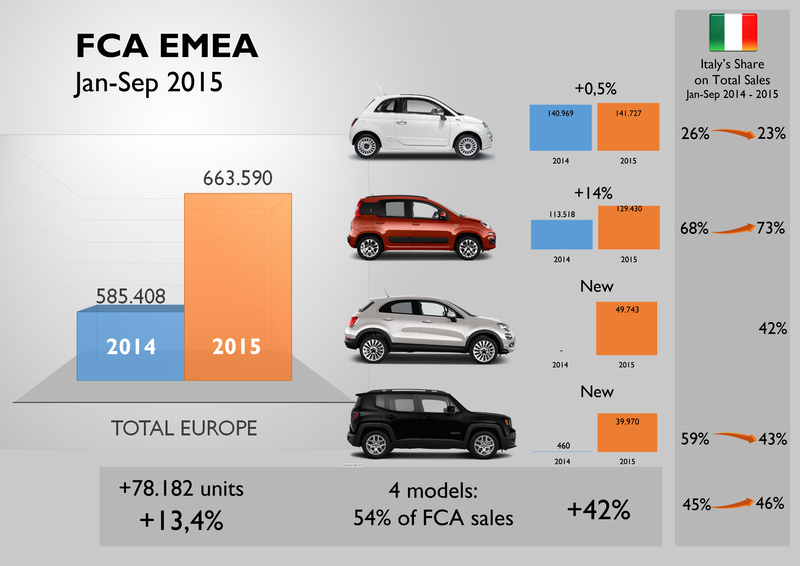 Jeep registrations are up a massive 159% in September 2015 YTD but it’s still a minor player in the European context. It sold 66.000 units with a tiny market share of 0,61%, and the Renegade sales are still quite dependent on Italian market: 43% of total. In the case of the Fiat 500X, its results so far don’t seem to follow the same success pattern seen in the small 500. Even if it’s an all-new car and makes part of the hot-selling B-SUV segment, the 500X is still behind the old Punto in the September YTD European ranking and 42% of its sales came from Italy. The small SUV from Fiat doesn’t perform well neither in Germany nor in Spain and is having a discrete role in France and in the UK one year after its official presentation in Paris motor show. Fiat leads the market thanks to the Palio, Strada, Siena and a strong declining Uno. What used to be an important cash generator 5 years ago, now has become in a source of problems for FCA considering the latest investments in Pernambuco plant. Brazil car market drops right as much as Russian one does: double-digit falls leaving behind many questions about how long the crisis will last. All car makers suffer but the big ones feel the consequences of having big plants producing fewer cars. September 2015 YTD figures indicate that Fiat sales declined a massive 34%, the highest fall in the top 10 and right above VW 33% and GM 31% drops. The only good news come from Jeep that right as it’s happening in Europe, it is growing at massive rates thanks to the introduction of the locally-built Renegade. The brand sold 22.700 units during the first 9 months of this year and now occupies the 12th position in the ranking by brands outselling Peugeot and getting close to Citroen. Argentina is the other problem. Fiat as a brand counts for 97% of FCA sales and it has posted the third worst result in the top 10 with sales down by 26% in the YTD ranking. The Jeep Renegade phenomenon hasn’t arrived yet as Argentina is charging big taxes to the imported and luxury cars (SUVs included). 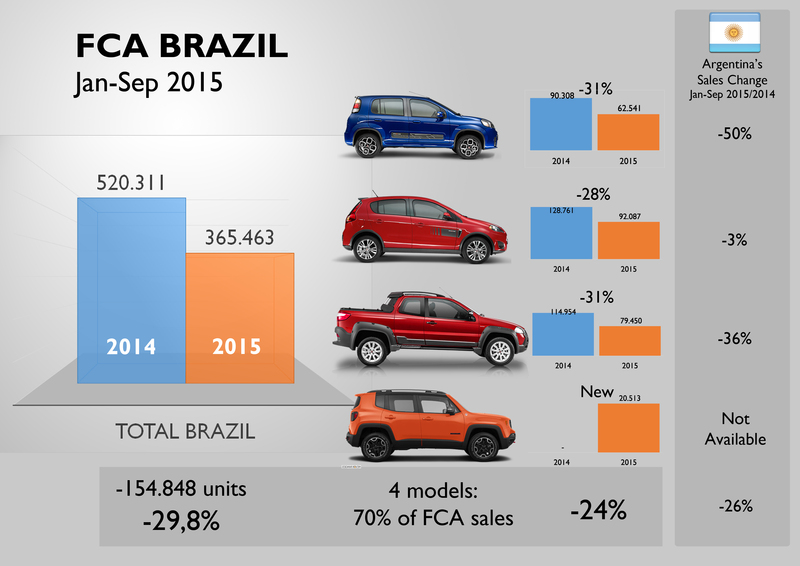 In other words if Brazil and Argentina’s volume drops are included, FCA stopped selling 173.858 units since January till September 2015 compared to the same period of 2014. This is a big quantity of cars that make of Pernambuco’s new plant even more expensive. Fortunately the Jeep Reneagde, the first product to come out from that new factory, is performing very well as it was the 11th best-selling car in Brazil in September outselling the Fiat Uno. The next big launch will be the Toro mid-size pickup that will be built in Pernambuco too. Hopefully these two cars will help the group to resist the Brazilian crisis waiting for the introduction of the new city-car, a smaller and cheaper minicar that is supposed to be a hit thanks to its price. Thanks for the short review of the situation Juan!